Due to the impending arrival of Hurricane Florence, the club will be closing tomorrow Thursday September 13 at 5pm. There will be no evening Kid Zone and all evening activities are canceled. Furthermore, we will be closed Friday September 14. In the event of wide spread power loss, the club will remain closed until restoration. We will communicate with all of you the best we can via our website and Facebook, however, please call the club before venturing out. Once power is restored, we can begin the clean up process and reopen. Should we be able to open Saturday September 15, there will be no morning Kid Zone, so please plan accordingly. 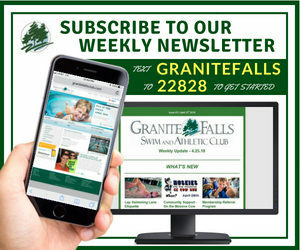 Thank you all for making Granite Falls Swim and Athletic club a great place to work and play. It is our strongest desire that everyone remain safe and sound as we go through this event together.